Aside from freedom and independence, the ideals of ‘Fourth of July‘ is deep set within the American pop culture — inspiring music, literature, films and even food! This males July 4 more than just a date in the calendar, a celebration, an anniversary. Just like with T.G.I.Friday’s, it has become a way of life that most Americans live by. The USA may be across the Pacific ocean from the Philippines, but this did not prevent Filipinos to celebrate with our American friends. July 4 is also Filipino-American Friendship Day. Let us commemorate it the true-blue American restaurant in our midst – T.G.I. Friday’s! First established in New York in 1971, and was first brought in the Philippines in 1994 by the acclaimed Bistro Group of restaurants, T.G.I. Friday’s has become an authority in quality American casual dining. Since it’s all about celebrating, we will give you another reason to boost your celebratory mood. 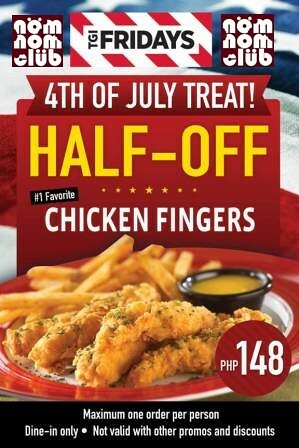 Everyone’s favorite Chicken Fingers, with its good old juicy glory, will be available at 50% off as a Fourth of July treat at only P 148! To celebrate the T.G.I. Friday’s Fourth of July promo even further, you can be one of the three winners of T.G.I. Friday gift certificates worth P 1,500! Simply join the Rafflecopter contest below from today until 8pm of July 4, 2013. We will announce the 3 winners by 10pm of the same day. Thanks to our T.G.I. Friday’s Philippines contest sponsor. Happy 4th of July to our American foodie friends and be a winning hero with T.G.I.Friday’s Fourth of July Promo! TGI Fridays BGC, cool ambiance and great services with awesome crews / staffs. TGI’ Frdays Alabang Town Center Branch! Abreeza Davao. I love the Ambiance plus friendly staff! I love T.G.I. Friday’s MOA! love t.g.i.f. trinoma and mall of asia!! My favorite branch is T.G.I. Friday’s ATC! Glorietta 3 with my wifey! BGC High Street Branchis probably the most fun branch.